California Baptist University in Riverside, California is a vital part of Riverside’s local and sustainable food efforts through its Food Innovation Center, which opened in September 2014. Part of the university’s Department of Health Sciences, the 4,000-square foot space provides extensive classroom, laboratory and kitchen space. Ronald Ellis, president of California Baptist, and Charles Sands, dean of the university’s College of Allied Health, envisioned a cutting-edge facility for training students, according to Margaret Barth, program director. She came to California Baptist to lead the new center. One of the primary calls of the Food Innovation Center, says Barth, is working with stakeholders across the community. One way in which Barth worked with the Riverside community was by leading a session at Seedstock’s Grow Riverside: Citrus and Beyond! conference in 2014. A college class from the center also attended a Riverside City Council meeting that related to Seedstock’s sustainable agriculture efforts in the region. Last semester, the center hosted stakeholder meetings for The Ark, a nonprofit organization that served special needs adults and children. Also, students developed gluten-free bakery products for Angel Wings Bakery, a nonprofit that uses its revenue to break the cycle of generational poverty. One of the center’s biggest emphases is new product development. In a multidisciplinary project, students follow the entire process, beginning with ideation screening and ending in production. 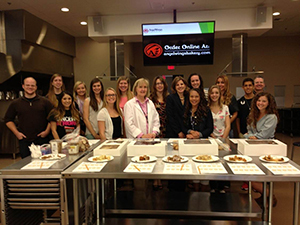 However, students at the center strive to improve the nutritional aspect of their products. To this end, they use a sensory evaluation lab, which helps measure sensory perception; and an instrumental lab, where precise measurements are taken. In obtaining ingredients, the center works extensively with local producers. Students may also take an international agriculture and nutrition class. “What you work on on a regional basis can be taken internationally,” Barth says. And indeed the Food Innovation Center is involved in nutritional efforts to fight cancer in China and to fight obesity in The Philippines, but the core of its work is focused on the city of Riverside and Riverside County. “We work with the Riverside Unified School District in hands-on nutrition education,” Barth says. “The focus in on fruits and vegetables.” She cites the effort of farmers, including citrus grower Bob Knight, in starting a garden nutrition program in Riverside Unified School District pilot schools. Additionally, the center is involved with a Riverside Unified School District pediatric research initiative, as well as nutrition assessment of senior citizens, which is aimed at reducing food insecurity. The center has also partnered with the Riverside County Department of Public Health, and works with Health to Hope Clinics in serving Riverside’s homeless population. The center collaborates with the San Manuel Band of Indians in identifying nutritive components in plant-derived foods, such as prickly pear cacti and stinging nettles. “There is a strong interest in native plants in Southern California,” Barth says. At Riverside’s Sherman Indian High School, students from the center collected data on high school students’ height and weight in an anti-obesity effort. Obesity is prevalent among Native American youths, according to Barth, and there is a strong interest among Native Americans in getting back to plant-based agriculture. Barth would like to see an urban farm program for The Ark featuring Native American plants. Barth says the goal of the center is on training students to become leaders. “These become skills for life, not just the course,” she says.